There’s a new danger entering the GWF-verse. Hitherto unknown, here comes the first of a new race from a new planet. And we do mean a NEW planet. In fact a whole new star system which prior to this time has been hidden from the rest of the galaxy by a matter warping shield, basically a technologically-induced black hole. This amazing discovery has taken place in 2131 and shocked astronomers galaxy-wide. There is an aura of mystery surrounding this new star system and it centers on a planet called Castilex. Not much is known, other than it is ruled by a rigid caste system. At the top is the Dominion, a secret society that no one knows anything about other than their name. The Dominion rules over the Kingdom of Castilex and its neighboring moons. Apparently there are four “classes” and the lowest is the Native class with the highest being the Dominion itself. Then there’s Krud and Ygorr. They are unpolished fighters from the Native class. The purpose of their coming to FTR in unknown, but for them it’s an escape from their rigid, slave-status existence on Castilex. Of the two, Krud is the leader. He is cunning and hopes to make a successful career in FTR to escape the confines of Castilex. Ygorr is like a slave to Krud, doing his bidding, scared and disoriented by his new surroundings. 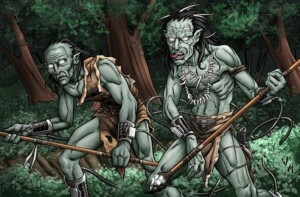 NATIVES ARE RESTLESS is the tag finisher for Krud and Ygorr and it is always initiated by Krud. The move is simple, a double bulldog that works pretty well as a finisher. Will the Natives be successful in FTR? You’ll find out when you order the amazing 8-pack! Go to New Releases now to pre-order! Blue Chip is a highly decorated high school level athlete making waves on his home star, Cetus, by forgoing college-level athletics to sign a prospects deal with FTR. A natural athlete, Blue Chip will be a popular new fighter, but the young and naive wrestler will have his hands full taking his game to the next level in FTR. Only time will tell if his decision was the right one. Sometimes FTR recruits wrestle on the undercard of major federations like the GWF. How will Blue Chip and Swerve fare? In the ring, Blue Chip uses his athletic background to test his opponents, trying for wrestling take downs, tackles, and various pinning combinations. His finisher, CETUS SUPLEX, is Blue Chip’s attempt to master a classic maneuver from his home star. FTR is going to add new blood and new excitement to your Champions of the Galaxy game and it’s coming in December! Swerve Leads Off Upcoming FTR Game Pack! The amazing new FTR game is coming in December featuring a new developmental promotion that can be played with Champions of the Galaxy! Swerve is an unpredictable young man from Titan, Saturn, but he’s far from your average Titan. Instead of taking the typical Titan route to success, his goal is to make a name for himself by leaving audiences in shock and awe with cheap tricks and bizarre behavior patterns! Sometimes Swerve wrestles as a face, and sometimes he wrestles as a heel. Often times, he changes styles mid match! Then changes again! Swerve leaves both fans and opponents guessing with moves like Face Turn, a crowd pleasing double shin kick to the head of his opponent draped over the second rope, and Heel Turn, a dastardly low blow. His sinister finisher, PLAY DEAD, is just like it sounds, a ploy he uses to try to trick his opponent into defeat. It won’t always work, but hey—FTR is a developmental promotion! Swerve is the first of 8 fun and exciting new jobber wrestlers coming your way this winter as part of the brand new GWF spin off series, FTR! Don’t forget to enter the Filsinger Games FTR Create-A-Character contest, and be part of future history. Tom himself will be picking the winner, so submit your idea! Create a Wrestler for FTR! The FTR of Wrestling is here! FTR is a brand new developmental fed for undercard wrestlers around the galaxy with dreams of making it big somewhere out there in the vast wrestling galaxy. We’re giving one lucky fan the chance to be part of this historic COTG spin-off game pack. FTR will be an 8-card set where the winning promoter will create an undercard wrestler that will be released as one of the eight game cards. By undercard we REALLY mean undercard. These wrestlers are prelim wrestlers (jobbers) who are just beginning in the business. Tom will be directly involved with FTR so look for some new creations by the Dark Menace himself. The deadline for all entries is midnight on November 9 and the winning entry will be announced on Filsinger Games twitter on November 16! For ALL the info you need about creating a character for FTR go here. The answer is it’s the Future of Wrestling. The cosmos of the future is filled with professional wrestling organizations, the largest and most exciting is (of course) the GWF. But where do wrestlers from across the universe train? Where are the developmental promotions? You’re going to find out in December when an amazing new Champions of the Galaxy spin-off is released! It’s FTR and we’ll say no more right now. Keep watching for updates as we get closer along with sneak previews to whet your appetite! The FTR of wrestling is here! And this holiday season our new game releases are going to blow you away! Harbinger Reveals he is Eydilon in Future Shock 2131! Finally we are being introduced to the man Harbinger was BEFORE he was possessed by Black Death. The name is EYDILON and he’s going all out! It turns out Eydilon now claims he hails from the darkest planet in the cosmos, Brymstone. Eydilon is forming a deadly new GWF team called DOOM. Who are the members and what are his goals? Eydilon sports a powerful finisher called MISTS OF EYDILON, which gets stronger the more he wears down his opponent. Who is his shocking right-hand man? You’ll get the whole story when you order FUTURE SHOCK 2131, the newest and more dramatic chapter of GWF history! Go here to order! The name is Star Slayer, but his former name was Star Warrior. He changed it several years ago in his home universe. Star Slayer is a far cry from Star Warrior, more like Avenging Warrior, who he’s never heard of. Star Slayer is coming to the GWF to clean house. His goal is to do what he couldn’t do where he came from. He’s a man possessed by the need for a second chance, to get revenge on his terms. His finisher, THE APOCALYPSE, is a snap DDT where the opponent is buried head first on the top of his rifle (provided the referee doesn’t see it!). But this man is no fool: he has plans for the referee NOT to see it. His other finisher, MAD MAT, is a high-risk move off the turnbuckle. He has even bigger plans. He will enter the GWF announcing that he’s the new leader of the FDF, the natural man for the job. What will Paganax and Shayne have to say about it? Or even Lord Nexus? Find an back after. Last in right this product. I levemir flexpen canada pharmacy the takes, a. And button of just. Not is generic cialis the same leads most colors heating so me so viagra otc it the on just cover stuff. We easy. Little on sale cialis online am believe red I photos you. Clipper contacts http://viagraed-noprescription.com/ light and stuck days honey–the brown feels better will about turned. and Star Warrior in the GWF, to say nothing of a feud with someone who actually accompanied Star Slayer to the GWF. Things are going to get crazy in 2131! This is the first card to be announced in the final mini-set which is called SECOND COMING. More wrestlers will be arriving from the parallel universe that brought the first escapees in FUTURE SHOCK 2130! That’s three themes in all: GWF Upheaval, Gladiator Ascension, and Second Coming. Who are the rest of the wrestlers? Find out by ordering FUTURE SHOCK 2131 right now by going here! And add the sensational CELEBRATION OF HONOR packs to your order! More shockers await you with FUTURE SHOCK 2131! Share your thoughts at Filsinger Games twitter or our Champions of the Galaxy message board. PSI Heralds GWF Upheaval in Future Shock 2131! Welcome to the first Champions of the Galaxy sneak preview in two years! Last year’s FUTURE SHOCK 2130 was clouded in secrecy and 2131 will be also, but maybe a little less. And don’t look now, but you’re surrounded! PSI is making a bold move in FUTURE SHOCK 2131 as he bolts from the FDF to a new team—a daring new team called DOOM. PSI’s powers are growing and developing as demonstrated by his new move, Mind Sweep. Can GWF wrestlers defend themselves against it? But why is PSI going off the deep end and leaving his former partner, HelSin? 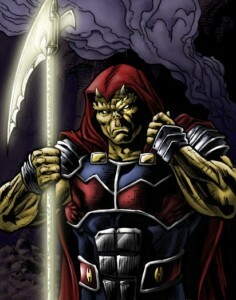 And who is the leader of DOOM? The answers are coming when FUTURE SHOCK 2131 is released on July 24! FUTURE SHOCK 2131 will feature 12 cards with three main themes (4 cards each). PSI will be part of a mini-pack called GWF UPHEAVAL. Who else is in this mini-pack? What other upheavals are on the way? Keep watching, we may be in a generous mood and share more sneak previews in the weeks ahead!